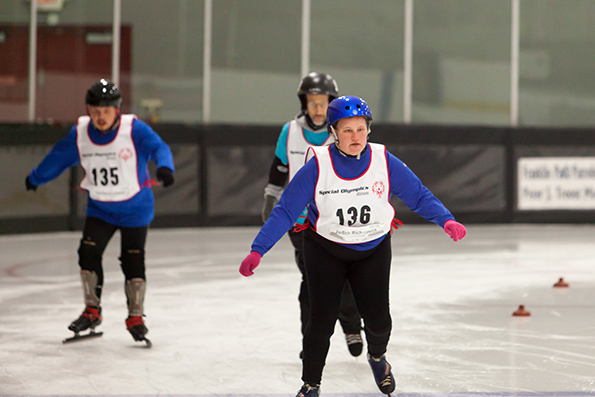 Special Olympics Illinois wanted to know what athletes thought about the changes this year for figure skaters and speed skaters. In the past, speed skaters and figure skaters competed as part of the Winter Games help in Galena. This year, they were moved from Galena to their own competition held Feb. 19-20 at Canlan Ice Sports in Romeoville. Thirteen speed skaters and 38 figure skaters competed and two youth figure skaters did an exhibition skate. I talked with all of the speed skaters and some of the figure skaters about the changes. All of the athletes except one were excited for skating to have its own competition. One third of the athletes said they missed Galena itself, the shopping, seeing their friends who compete in other sports, the parade and the bigger dances. All of the athletes like the new skating facility because of its size – it has 3 rinks – saying it is really clean, you can watch both sports at the same time, the location is good, being able to see their friends and they liked the layout. All of the skaters said they really liked the volunteers because they were very friendly, helpful, welcoming and knowledgeable. And, all of the athletes liked the dance, even though it was different from previous dances. There were some technical problems at Opening Ceremonies though. Half of the athletes have been skating for nine years or less, with three skating for more than 16 years. All of the athletes except one had been at as many Winter Games as they have skated. 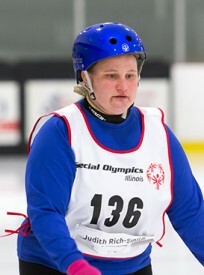 For one athlete, this was the first state-level skating competition. The skaters are looking forward to next year’s Skating Championships, seeing their friends, making new friends and showing what we can do!